Lilienthal Praises Atomic Energy Week Purposes David E. Lillenthal, chairman of the U. S. atomic energy commission, had high praise for atomic energy week, scheduled for Burlington, Oct. 25 to Nov. 1. Lillenthal said, "The plans are heartening to every person who believes that an informed and independent public opinion, developed within the committee of America, is essential to wise control of this great force so that it shall in the end strengthen and not weaken the democratic way. 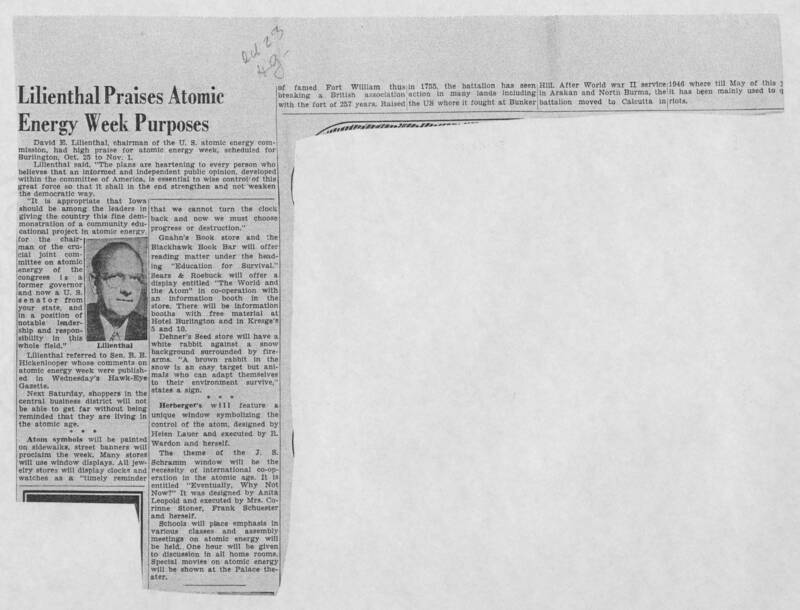 "It is appropriate that Iowa should be among the leaders in giving the country this fine demonstration of a community educational project in atomic energy, for the chairman of the crucial joint committee on atomic energy of the congress is a former governor and now a U. S. senator from your state, and in a position of notable leadership and responsibility in this whole field." Lilienthal referred to Sen. B. B. Hickenlooper whose comments on atomic energy week were published in Wednesday's Hawk-Eye Gazette. Next Saturday, shoppers in the central business district will not be able to get far without being reminded that they are living in the atomic age. * * * Atom symbols will be painted on sidewalks, street banners will proclaim the week. Many stores will use window displays. All jewelry stores will display clocks and watches are a "timely reminder that we cannot turn the clock back and now we must choose progress or destruction." Gnahn's Book store and the Blackhawk Book Bar will offer reading matter under the heading "Education for Survival." Sears & Roebuck will offer a display entitled "The World and the Atom" in co-operation with an information booth in the store. There will be information booths with free material at Hotel Burlington and in Kresge's 5 and 10. Dehner's Seed store will have a white rabbit against a snow background surrounded by firearms. "A brown rabbit in the snow is an easy target but animals who can adapt themselves to their environment survive," states a sign. * * * Herberger's will feature a unique window symbolizing the control of the atom, designed by Helen Lauer and executed by R. Wardon and herself. The theme of the J. S. Schramm window will be the necessity of international co-operation in the atomic age. It is entitled, "Eventually, Why Not Now?" It was designed by Anita Leopold and executed by Mrs. Corinne Stoner, Frank Schuester and herself. Schools will place emphasis in various classes and assembly meetings on atomic energy will be held. One hour will be given to discussion in all home rooms. Special movies on atomic energy will be shown at the Palace theater.